. 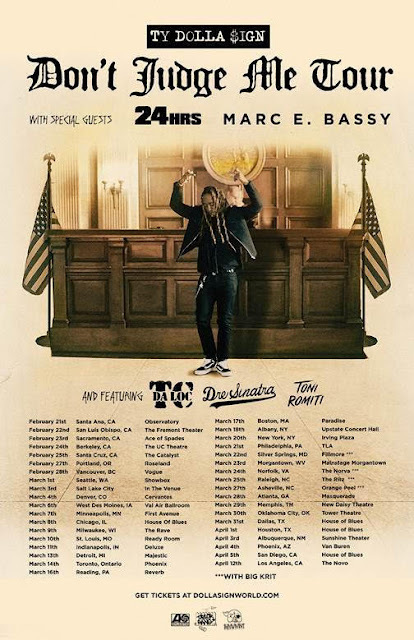 @tydollasign Embarks on Don't Judge Me Tour Next Month! is headlining the Don't Judge Me Tour next month in celebration of his long-awaited sophomore album BEACH HOUSE 3 in a city near you. Fans will experience his classic cuts and cult favorites from the album -which Pitchfork called "a superbly refined collection of songs, carefully crafted, smartly cast, and ruthlessly listenable-“ plus, some songs will be performed live for the very first time! Fans will also enjoy live instrumentation from the hip-hop superstar, and some special surprises- Ty is known for bringing a few of his celebrity friends out on stage during his set! You don't want to miss it! See full tour itinerary above.